With a population of about 330,000 and an geographical isolation from the rest of the world (including Europe – it’s over 800 miles just to reach Scotland), Iceland is perhaps not an obvious home for cutting edge heavy music. Nevertheless, in recent years a steady stream of high quality acts has surfaced, particularly from the world of extreme metal. After years of primarily being associated with Sigur Rós and art-pop icon Björk, the country has become something of an unlikely hotbed of quality rock and metal music – here are just 10 of the bands worth getting excited about. Before we look at the current wave of bands, we must mention HAM, an Icelandic rock institution. Formed back in the late 80s and active again (following a short hiatus) from the beginning of the millennium until today, the band play hypnotic, insistent and somewhat melancholy rock with a touch of goth and dash of heavy metal, all topped off with distinctive (and occasionally somewhat unhinged) vocals. 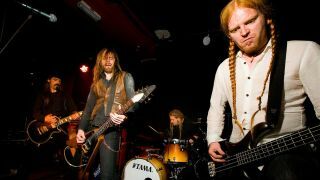 Not only the most famous heavy metal band in Iceland, but one of the best known bands in the country generally, Sólstafir have evolved considerably since their 90s black metal beginnings. Today their music straddles numerous genres, with atmospheric post rock elements surfacing regularly despite definite metal leanings, with compositions bearing a melancholy and haunting touch that has won them fans from across the world. Surfacing during the 00s, Svartidauði exploded onto the black metal scene with their debut full-length Flesh Cathedral, released in 2012. Its eerie, dense, claustrophobic and generally unrelenting atmosphere (as well as nods to French avantgarde talent such as Deathspell Omega or Blut Aus Nord) impressed fans around the world and arguably led the way for a new wave of black metal bands from the country. Another of the big names in Icelandic black metal, Misþyrming have earned themselves an enviable reputation on the back of both their sole album release (Söngvar elds og óreiðu, issued in 2015) and some fearsome live performances. Dissonant and furious, their harrowing compositions present a murky wall of noise dripping with apparent occult intent. The final part of what could be described as a ‘big three’ of the contemporary Icelandic black metal scene, Sinmara share a taste for claustrophobic and somewhat ritualistic-sounding dissonance. What sets Sinmara somewhat apart is a more measured and calculating feel, their arsenal of riffs and rhythmic shifts captured with effective clarity. Formed a decade ago when its members were only 12, The Vintage Caravan play trippy psychedelic rock songs (often with similarly trippy psychedelic videos to booth) with a heavy 70s influence. Big riffs and a warm fuzzy sound provides the backbone to the band, but imaginative songwriting and instrumental meadering keeps things from becoming predictable. With a rather blackened take on the death metal template, Angist definitely share a touch of the dark oppressive intensity that seems to have become a hallmark of Icelandic extreme metal. Unlike their peers, there’s plenty of influence from the 90s US death metal pioneers with slower, doomy passages effectively breaking up the aural bombardment. Zhrine rose from the ashes of the memorably-named Gone Postal, a death metal outfit that was active from 2007 to 2014 and who are worth a listen in their own right. The change to Shrine and then Zhrine (presumably due to there being many other Shrines out there) has seen the band embracing a more contemporary black metal sound, though some death metal touches remain. With a great use of dynamics and a real sense of journey in their songs, this is a very promising ‘new’ band. 2016 has been a good year so far for Auðn, who won the right to represent their country at Wacken Open Air Metal Battle and then managed to come 3rd place in the final competition in Germany. Their sound can accurately be described as atmospheric black metal, their moody, groove-laden and precise songs having a hint of Satyricon about it – no bad thing we say. Another band who have evolved from their black metal roots toward a more individualistic and eclectic sound, Kontinuum are a hard band to pin down stylistically. Their music is dramatic and features plenty of post rock touches as well as hints of gothic and doom metal, bringing to mind Cult Of Luna, Katatonia, Agalloch and countrymen Sólstafir.